Select partition from the left panel from which you want to recover data from the list of available Logical or Physical Drives. NTFS Data Retrieval Software recovers lost files and folders from NTFS based file system on windows operating system. Read-only and Non-Destructive NTFS Data recovery program performs data recovery on NTFS partitioned drives. Data Recovery Doctor for Windows NTFS recovers files and folders lost due to overwritten, deleted, formatted, damaged or corrupted partitions. 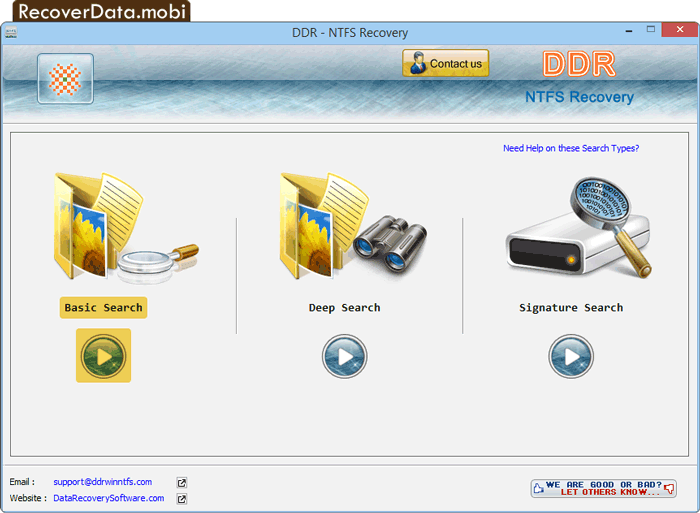 NTFS data recovery software retrieves lost files when corrupted MBR (Master Boot Record), MFT (master file table), partition table, boot sector or root directory entries. Recovers files from deleted or formatted NTFS hard drive partitions. Recovers files on ATA / SATA / SCSI hard disk drives. Recover encrypted and compressed files on NTFS drives. Support localized and long file name. Easy and Safe to use hard drive data recovery utility.